The MARSTM is a rugged and reliable machine - specially designed to be easy to install and maintain. Basic equipment and options are described below. The primary assemblies of the MARS include the upper structure and the flattening/slider bed. The MARS upper structure includes the control box, the air tank, the air cylinder, the splash shields and other components. It also includes the plow blade and its supporting structure. This assembly spans the conveyor above the belt, with the plow blade facing the tail pulley end of the conveyor. 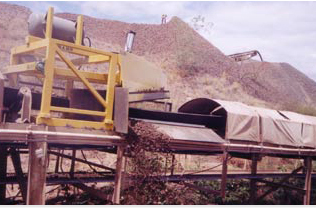 The plow blade will discharge material either to the left or to the right of the conveyor (looking from the tail pulley toward the head pulley). The right-hand or left-hand configuration of the plow blade is specified when the MARS is ordered and is permanently set at the factory. The MARS flattening/slider bed is a rectangular assembly that replaces the idlers underneath the plow blade and continuously supports the belt. The plow blade flattens the belt against this bed to divert tramp metal off the conveyor. The bed is specially equipped with UHMW to protect the belt and to ensure proper flow of material. In general, the MARS is a few inches wider than the belt and is approximately twelve feet long. Its exact dimensions depend on the width of the conveyor. AFOR Systems, Inc. along with the MARS. The MARS is designed, built and shipped to make installation easy. As an option, however, AFOR Systems, Inc. can supply supervisory personnel to oversee the installation and start-up of the equipment. MARS is versatile and can be custom designed for a variety of applications.